It was a beautiful fall day at Orphans of the Storm®, and there were plenty of people coming in to meet their future family member! Several happy adoptions took place while I was there, including one of the dogs I was planning on writing about this week. There are still plenty more ready to find their forever homes! 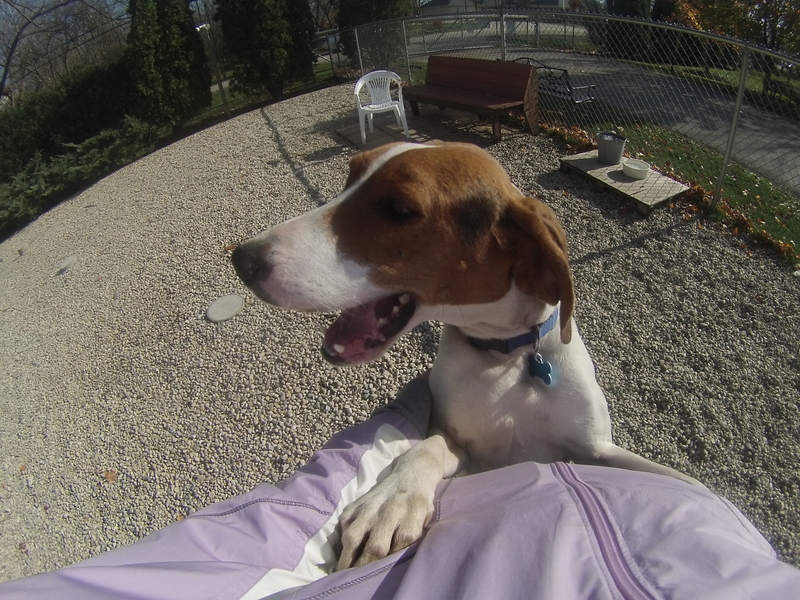 Lexi the six-month-old Treeing Walker Coonhound mix (not to be confused with the other Lexi) is a real sweetheart. She was found as a stray, but she seems to have pretty good manners–especially for a pooch that’s still in puppy phase. She politely waited to have the leash put on before leaving her kennel and didn’t pull too much when we were on our walk. Lexi liked being free to roam around the off-leash run and would sometimes disappear behind the bushes, but I could always hear her snuffling around. She said hello to the dogs on the other side of the fence but wasn’t overly interested. When she finished her exploring, she came back to me and enjoyed a good scratch on the back and behind her floppy ears. She even ended up giving me a few doggy kisses. Say hello to Lexi on your next visit to the shelter! 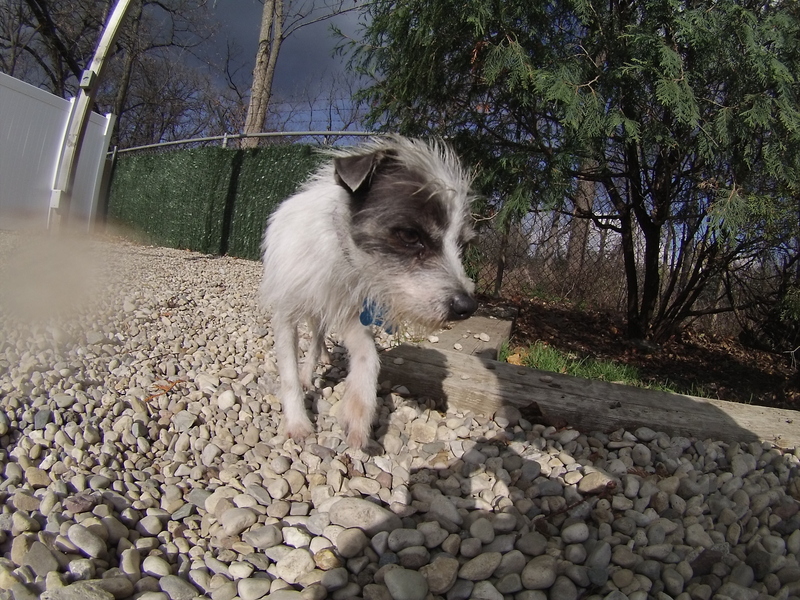 Oliver the two-year-old Chihuahua mix is so adorably tiny. But inside that small body is a big personality! Oliver was happy to take the lead on our walk and made sure we covered plenty of ground before we went into the off-leash run. For the first few minutes, Oliver kept to himself and scurried around. But once I sat down on the ground, Oliver immediately went into lapdog mode. Oliver hopped right into my lap and wiggled around a bit to make himself comfortable. Once he found the perfect spot, he stayed there and didn’t budge. Even when it was time for us to let another dog use the off-leash run, Oliver didn’t want to get off my lap, so I just picked him up and carried him. He’s an affectionate guy who isn’t shy about giving doggy kisses and cuddling. 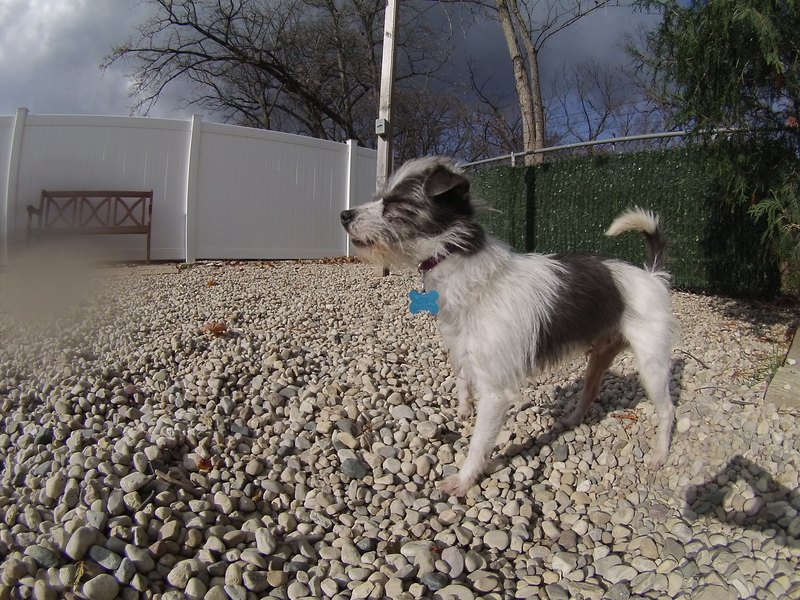 If you’re looking for a lapdog with lots of spirit, come in soon to meet Oliver! 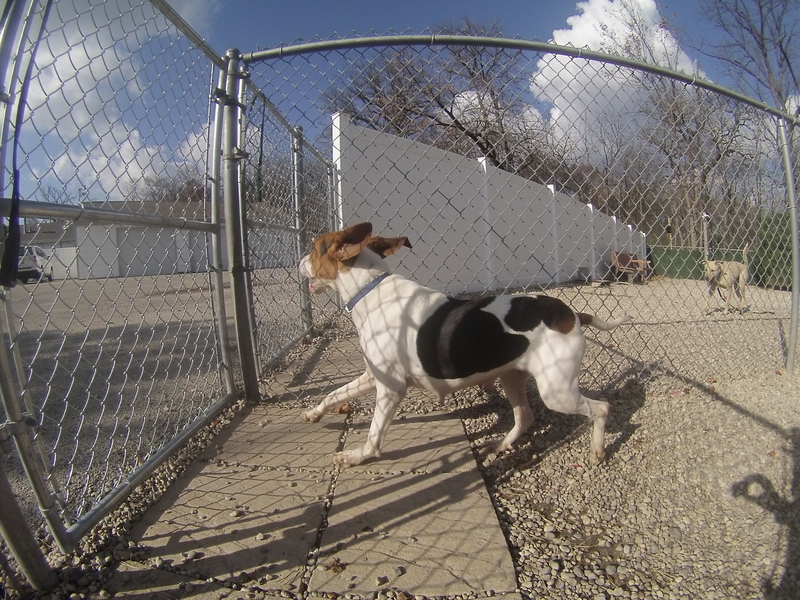 Hunter the two-year-old Treeing Walker Coonhound mix is an outgoing girl. Actually, “boisterous” might be a good way to describe her. Hunter wants to be everywhere at once, always has her tail wagging, and has quite a voice. Hunter is definitely a people-dog in that she wants to say hello to everybody and will gladly offer doggy hugs. She was fine hanging out in the off-leash run, but like Old Red last week, I could tell she wanted to run on the trail. And run we did! Hunter was thrilled to be in the forest and could barely contain her excitement. She made sure to tell everyone how happy she was to be out and about by doing the signature Hound howl all the way around the trail. Her exuberance caused many people to smile as we ran past. Hunter would do best in an active home with people who like to go for walks or runs. If you think that might be you, come in soon to say hi to Hunter! I also saw Bear, Blush, Courage, Donna, Gypsy, Kanne and Osito, Precious, Skippy, and Willow. 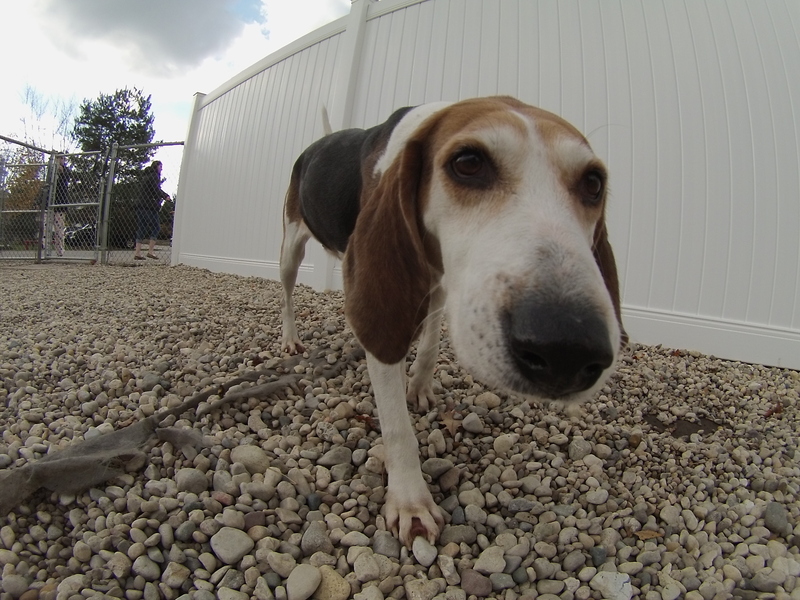 Posted by Meet the Pooches on November 13, 2015 in Dog Profiles and tagged adopt, adoption, animal shelter, animals, Chicago, Chihuahua, Deerfield, dogs, Orphans of the Storm, pets, Riverwoods, Treeing Walker Coonhound. What sweethearts! Oh, to have a bigger house and yard to take them all in. Thank you for posting, we had never heard of Orphans from the Storm until your post, what a great program! Thank you! I’m glad to hear this blog is helping to spread the word about Orphans of the Storm. It’s definitely hard not being able to bring all of the dogs home with me at the end of the day, but I know they’ll find good homes.